So, now I can be completely honest about my mentee and work and whatever else I want!!! ha! I had my meeting today with Kashmir... That is "C". Whew. What a release to not cover it up!!! I just wish I had saved the old posts so that I could repost for those that missed it. After the last meeting, the counselor had a discussion with her. She found that Kashmir did admit to asking for items including gold earrings and ipods and Wendy's. She also stated that these were all things she has never had nor would ever have the chance to have at her own home. Kind of heartbreaking. But in the same moment ~still kind of still feeling a little manipulated. This girl is just SO freaking smart! Either way, I didn't bring her anything this trip and I just suggested playing a game. 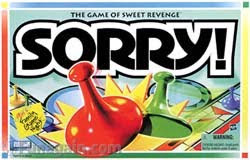 We played Sorry and by the end of the 45 minutes, there were 4 other kids at our table playing. Much less "deep" but just as rewarding and it was good to see her come out of her very introverted shell. Just a quick line to let everyone know that I made this private for a few reasons! 1. I have a LOT of work people on my friend lists now and some are pretty vital to my career and I don't want to say anything to anyone that would cause offense. 2. I want to be able to talk very openly about my mentee situation and not worry that she is going to find it. 3. I want to be able to talk very openly about EVERYTHING and not worry the wrong people will see it. 4. I post pictures of my kiddos and don't want the world to know what they look like. Sorry I havent written in a little bit. Since I removed my last few posts, I am struggling with what to write on this thing. I know everyone does, and I started out writing this as a way to track my kiddos progress since I am terrible at scrapbooking and baby books. But then it turned into something bigger. A diary of sorts and sadly, a bit of an ego trip since there were strangers that actually cared what I was saying on here.... Heck, I even had people coming up to me at work saying that I missed my calling. That I should be writing for a living. Now I know I am definitely not that good in reality, but the words made me want to look for important and interesting things to write about. So, as for me, I got back Friday from 5 days in Charlotte, NC which was another professional success and a personal fail. I have to say that for the most part, my husband did a much more awesome job of leaving the guilt quilt in the drawer and just being supportive. I am very very thankful. Thank you babe if you are reading this. I cannot relay enough how much it means to me. Did I mention we are all coughing up lungs every five minutes now that I am home? Its awesome.